Poor 11th Avenue. 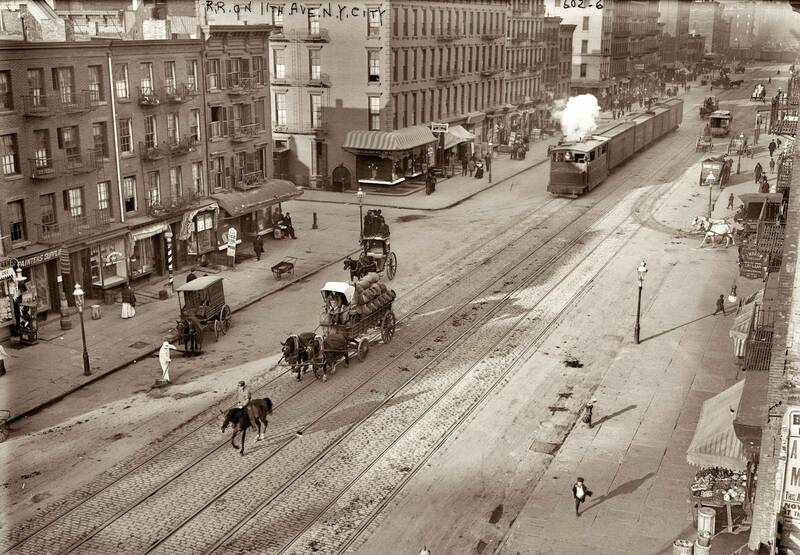 About a century ago, this unpretty stretch along Manhattan’s West Side, surrounded by factories and warehouses from Chelsea through midtown, also had train tracks on its surface to accommodate the New York Central freight line. 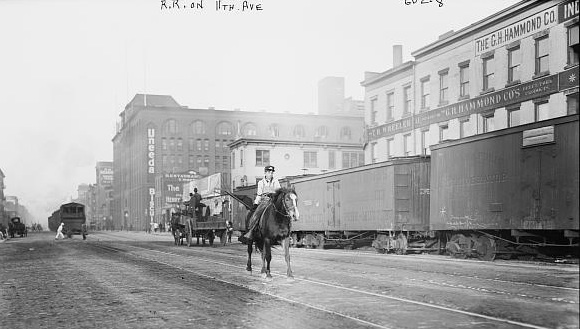 To warn vehicles and people away from oncoming trains, a group of men on horseback called the West Side Cowboys rode ahead of the trains, waving a flag. But not everyone paid attention—note the guy in white crossing in front of a train in this undated Bain News Service photo. After years of community group and city pressure, the tracks were torn up in the 1930s. They were replaced by the High Line, which picked up its last shipment from one of the avenue’s factories in 1980. This entry was posted on August 16, 2010 at 5:57 am and is filed under Chelsea, Disasters and crimes, Hell's Kitchen, Politics, Transit. You can follow any responses to this entry through the RSS 2.0 feed. You can leave a response, or trackback from your own site. Please grant me permission to create links to some of the free sample photographs on your website into an electronic detective novel I’m writing and want to sell from the ITunes book store. By create links to some of your images into my book’s text in areas where the plot has comparable scenes, along with your web address, you would get free advertising and product placement. I would get scenes that enhance my novel. Thank you for your consideration. I love your web site and hope you consider this mutually profitable arrangement. I found this picture of 11th Ave dated approx 1907. http://i.imgur.com/XG5qP.jpg A look at Google Streetview indicates that this bit of 11th has changed quite a bit in 100yrs.